The original, pure and “native” UEFI hardware testing software. Building on the tradition of its infamous, feature-rich partner, Pc-Check Self-boot for legacy PCs, the latest UEFI release breaks boundaries. No operating system in the way – no Linux, no Windows, no secure boot interference – only pure UEFI testing in real native-UEFI mode. 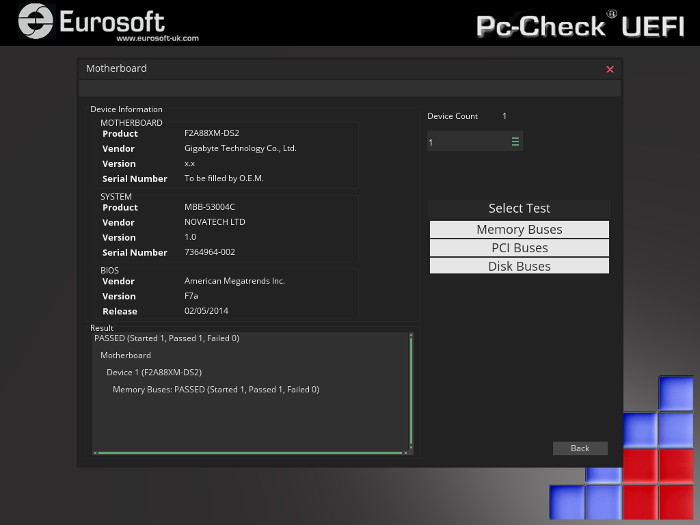 Pc-Check UEFI diagnostics takes on this wider testing landscape with an entire new set of tools and applications. The end result: components are reliably tested and validated independently of the operating system with secure boot enabled. Proven diagnostics, capable of assisting all sizes of companies and skill sets, loads of testing features and unlimited ways of using them. Reduce component replacement costs by returning faulty components with industry recognized proof of failure reports. Eases customer resistance to test and servicing. XML style test reports allow flexible reporting of diagnostic test results and system information to be printed or stored in a database. 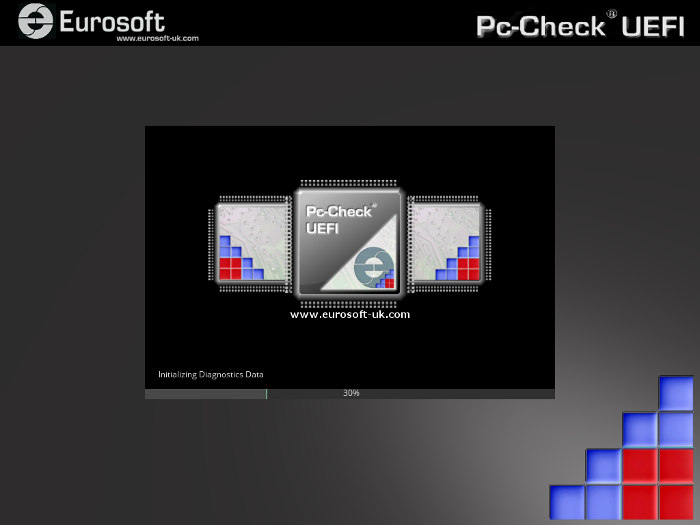 Pc-Check UEFI is easy to use by all staff regardless of technical skill level. 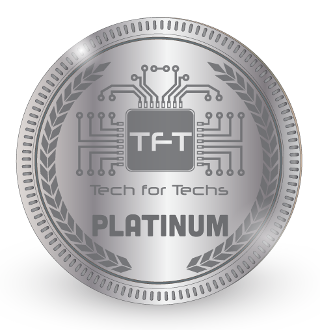 Create easy to follow test scripts, so your team provides consistent testing every time, saving hundreds of man-hours in fault testing. Guarantee the reliability of all the systems you build, install, or service. Reduce returns and increase profits by ensuring hardware failures are identified before machines leave your process. Save valuable time by carrying out all of your hardware tests through a single software package. Automatically restart the system into pre-boot UEFI diagnostics. Seamlessly return to Windows for additional testing of driver dependent hardware and reporting. Progressive, native UEFI and Windows testing, giving you “Dual Boot” tools to master all PC hardware problems. Pc-Check UEFI directly access and tests all major computer components. Utilizing a proprietary boot loader, signed for security by Microsoft, there is no need to rely on third party boot solutions such as Linux. How much time are you losing juggling freeware or vendor specific tools to deliver a robust test plan. Are you confident that customers’ PCs are delivered thoroughly tested? Can you easily prove the reliability of your maintenance contracts? Do all your team have easy to follow test plans to provide consistent testing every time? Leading the way, new Pc-Check UEFI diagnostics serves the widest variety of technical users, testing any UEFI compatible hardware, regardless of brand, whether server, notebook or other PC designs. Transform your testing with timely, customer-presentable diagnostics. PC manufacturers, servicers, refurbishers, and retailers need to track PC reliability and solve computer problems. Pc-Check UEFI finds problems fast – proves great systems – guarantees reliability. 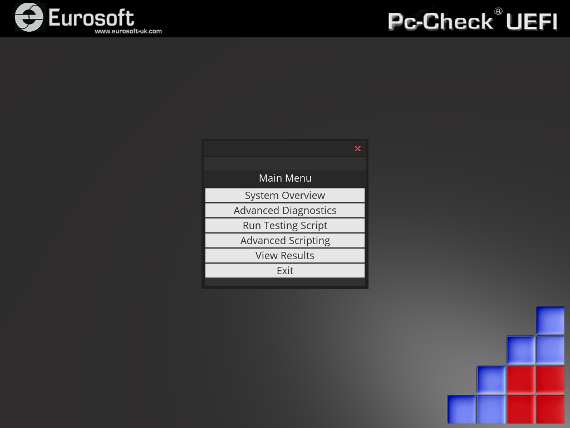 Add Pc-Check® Windows® to Expand Your Test Coverage into Windows® and WINPE. Pc-Check UEFI is perfect for testing outside the operating system, add Pc-Check Windows to expand your testing into Windows. Windows testing allows you to test devices that require Windows based drivers to function such as webcams, graphics accelerators, and wireless network interfaces. Pc-Check Windows can also reliably test RAIDs, sensors and laptop batteries. Pc-Check Windows gives you a testing advantage with Windows®-based computers. Fully compatible with Windows 10, Pc-Check Windows diagnostic software ensures that components are reliably tested and validated in the environment in which they are used. Windows comfort zone, all devices explored –reliable hardware tests you can count on.